It is rarely OK to miss the birth control pill. It is common to occasionally miss one or two days of your pill in a row, but more than that may reduce the effectiveness of the pill and increase your risk of pregnancy. This pertains to all forms of birth control pills that contain estrogen or estrogen with progesterone. If your birth control pill contains progesterone only, often referred to as the “mini-pill,” missing even one pill by more than three hours can increase the risk of pregnancy. Specifically, if your birth control pill delivers 30 mcg of estrogen or more, you can miss two consecutive pills without worry, but three or more missed pills will increase your risk of pregnancy. For estrogen pills delivering less than 30 mcg of estrogen, missing two or more pills increases your risk of pregnancy. The dosage of estrogen delivered by your birth control pill should be written on the pill package or you can find out from the prescribing physician or pharmacy where the pill prescription was filled. Another factor is the place in your pack when the pills were missed. Missing one to two pills during the first two weeks of your pack can increase your risk of pregnancy. 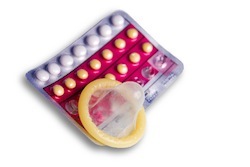 Use backup birth control for seven days after missing the pills to ensure pregnancy prevention. During this time, you can take two pills in one day to “catch-up” on the pills you missed until you’re back on track.